People often wonder how we at ATLAS feel about those bozos our good friends at CMS, and vice versa. The two experiments are trying to discovery exactly the same things, and as Monica discussed a while back, trying to keep from getting scooped by the other experiment will be nerve-wracking. Personally, I like to think of CMS as the baseball team on the other side of town. Yes, we plan to beat them at everything, every time — but deep down, we know that if they weren’t there, we couldn’t play baseball. I’d even say it’s a friendly rivalry, more like the San Francisco Bay Area than New York or Chicago. Although it’s hard to say — I’ve seen hats that say A’s on one side and Giants on the other, but I have yet to see any ATLAS/CMS merchandise. Hello World! I another new US LHC blogger, drafted by my friend and ATLAS Control Room buddy, Monica Dunford. 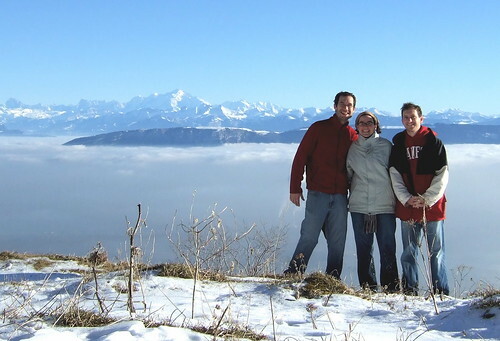 That’s me in the picture above, next to Mont Blanc, my husband Dan Spoonhower, and our friend Michael. I’m a postdoc for Columbia University, working on the ATLAS experiment, and I’ve been working at and living near CERN for over a year. I was working in the ATLAS control room a few weeks ago the day that the LHC had its … major malfunctions. I had been hoping that we might have the first collisions that weekend. I was sitting at the same desk that Adam had been sitting at, waiting and hoping the week before. Instead of waiting for collisions after the news came in, we were waiting for more details and talking amongst ourselves. There were a bunch of people in the control room that I knew, from working on ATLAS or from previous jobs. Each person could provide a different perspective, and talking to people got me thinking about the small world of High Energy Physics. It’s true that we work with thousands of scientists on ATLAS and CMS, but we get used to seeing a lot of the same faces around. For example, Monica was in the control room that weekend, too. I work on ATLAS with a few of the bloggers on this site: Monica, Adam and Seth. Working at the same desk with me that weekend was my friend Louise, and it happened that she knew Monica not because they both work on ATLAS, but from their previous experiment, SNO. 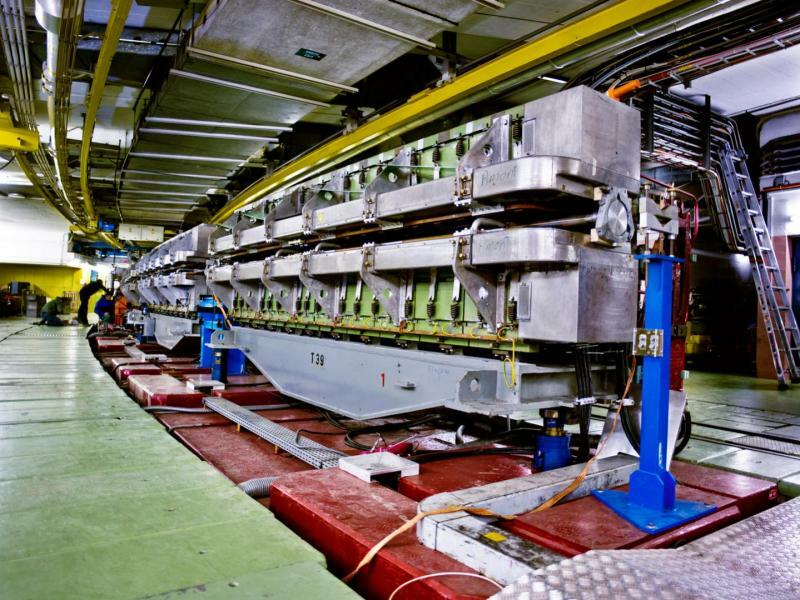 Before coming to CERN, I had been working at Fermilab, outside of Chicago, and many people at other desks in the control room that weekend had been Fermilab folks, too. Some familiar people to readers of this blog, Steve and Ken, were also colleagues of mine at Fermilab on the CDF experiment. I worked in the same group at the University of Michigan with Ken, while he was a postdoc and I was a graduate student. Steve worked with a different group, but he was one of the people that I remember hanging around the CDF control room all the time. He helped answer my questions when I spent my first summer there as a student. Now, I’ve become the postdoc who is hanging around the ATLAS control room all the time, trying to answer other people’s questions. Ken and Steve and I have gone from CDF collaborators to (good-natured!) ATLAS-CMS competitors.